Weapon Stats & Strategy for Quad Launcher in Fortnite. Read here to find information about the damage(DPS), rarity, and reviews for Quad Launcher! The Quad Launcher has been vaulted as of January 22, 2019 as part of the v7.20 Content Update. This article will be updated when it returns to the game. 80 315 4 80 4.75sec. 84 330 4 84 4.5sec. 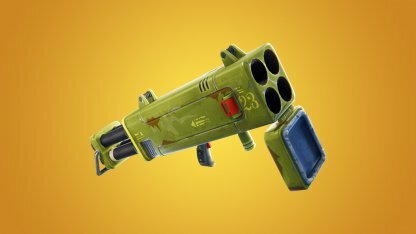 The Quad Launcher's area of effect and power makes it a great weapon to use in Teams. The Quad Launcher is most effective when using against enemies at close to mid range. The Quad Launcher will be able to fire four rocket shots before having to reload. Use this to constantly pressure the enemy with a rocket constantly flying at them! The Quad Launcher behaves much the same way as the rocket launcher in the game. Its rockets have travel time, explode on impact, and deal damage over an area of effect. You do not need to shoot directly at the enemies since the Quad Launcher will deal damage around an area of effect. Try aiming at the ground they're on to increase your chances of getting hits! The Quad Launcher may behave like a Rocket Launcher, but a big difference is how it can fire four shots before reloading. You can harass the enemy by continuously bringing down their structures, giving them no place to hide!